We hope this finds you all well in the unwavering heat. 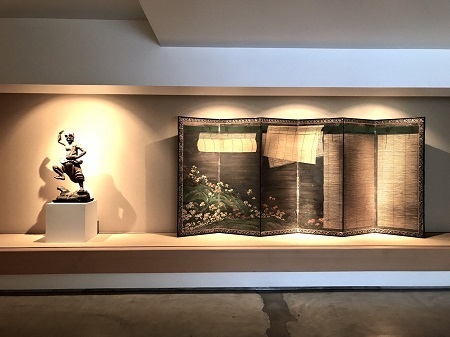 We would like to announce the latest rotation of exhibits at the Shirokane gallery, featuring our regular summer display piece, Bamboo Blinds. It is a wonderful work, as the blinds painted in heavy gold pigment have a three-dimensional feel, and the scene visible outdoors beyond them has a refreshing air about it. 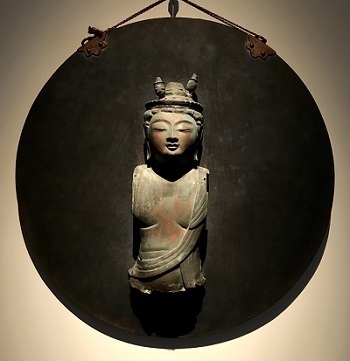 This beautiful kakebotoke with an image of Juichimen Kannon Bosatsu is also on display. If you happen to be in the area please stop by and have a look, even if just to cool down for a moment.